NEW! This is a high-performance LiPo battery pack for the Parrot AR.Drone and AR Drone 2.0 version. 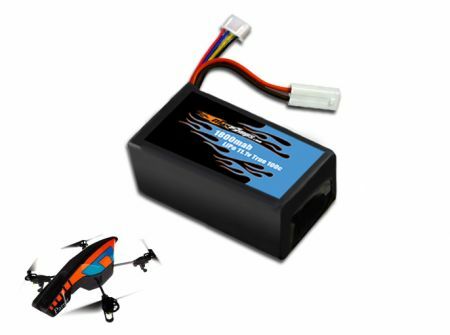 The ultimate upgrade from the stock pack, this pack boasts a large capacity of 1800mah for 45% more flight time. It features a 100C rating for tons of punch and extra power. Pack includes JST-XH balance connector and small Tamiya female plug so you can charge it with your original stock AR Drone wall charger, or upgrade to a hobby-grade charger for faster charge times. Ultimate battery pack upgrade for your Parrot AR Drone and AR Drone 2.0 version. Get up to 45% more flight time than the stock 1000mah pack. Note: If you have the AR Drone 2.0 charger only, you will need to upgrade to a hobby-grade charger that allows for charging with the Tamiya plug or JST-XH balancing tap.